Congratulations to all our “Winning Words” winners! First Place went to Danielle Braun from Elkhorn Area High School (Prose) and Michael Wicks from Big Foot High School (Poetry). 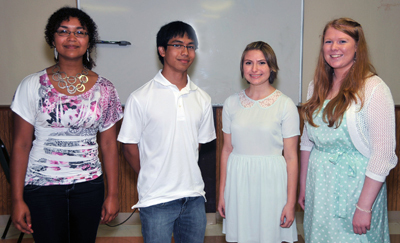 The Walworth County Arts Council recently awarded cash prizes to the winners of their 2013 Winning Words writing competition. Pictured, left to right, are Melonie Wright, Delavan-Darien High School, second place, prose; Raphael Dawis, Williams Bay High School, second place, poetry; Jessica Gagliardo, Williams Bay High School, third place, prose; and Danielle Braun, Elkhorn Area High School, first place, prose. Not pictured, the first place poetry winner, Michael Wicks, Big Foot High School and the third place poetry winner, Rebecca Ochoa, Big Foot High School. 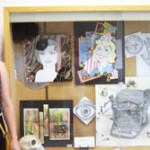 The Arts Council received 123 entries this year from Walworth county high school students. By sponsoring the Winning Words competition, the Arts Council seeks to encourage young writers and promote writing excellence.